What is it that makes one writer a Twain, another a Poe? What defined the thought of William Faulkner, or Friedrich Nietzsche, for that matter? Maybe it's all in the 'stache. 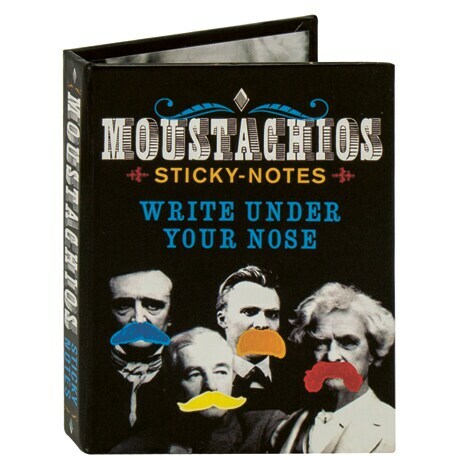 Just see if your jottings don't become more literary with these moustache-shaped sticky notes, modeled after the real-life cookie dusters of the aforementioned literary greats. Presented in a book-like, pocketable portfolio, these 240 moustaches—60 of each, attached to the appropriate author photo—average just under 3 inches wide, and in a pinch you can use one for a handy disguise.